Fr John Fahy with his Irish wolfhound Bran. 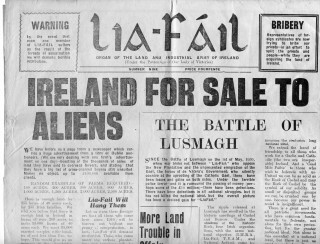 The Lia-Fáil Newspaper founded by Fr John Fahy. 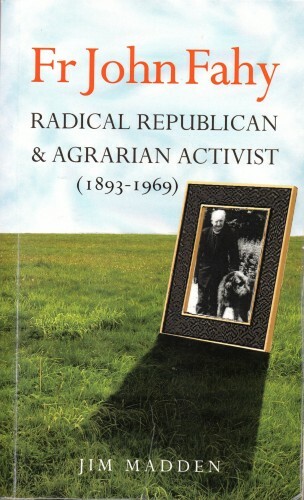 Jim Madden's book on Fr John Fahy, Radical Republican and Agrarian Activist. Fr John Fahy was born in Killeenadeema, Loughrea in 1893. He had a colourful, turbulent and controversial life as a priest. He spent the last 10 years of his life (1959-1969) as a curate in Abbey. Fr Fahy attended the local National School in Killeenadeema and in 1907 was enrolled as a boarder in the Clonfert diocesan college, St Joseph’s, The Pines, Ballinasloe. He then entered St Patrick’s Seminary, Maynooth. He was ordained a priest in St Brendan’s Cathedral, Loughrea on 28 September 1919 and served in Dundee (Scotland) for 2 years before returning to Ireland. A succession of appointments followed in Eyrecourt, Clostoken, Bullaun, Kilconnell, Ballinakill and Lusmagh before his final 10 years in Abbey. From the outset, John Fahy’s radical republican views were evident. In Maynooth during Easter Week 1916, he made strenuous attempts to mobilize his fellow clerical students to march to Dublin to participate in The Rising. Shortly after he arrived in Dundee, Fr Fahy, as Chaplain and Captain of the 1st Scottish Brigade of the IRA, became involved in getting munitions to Ireland for the War of Independence, then raging. Fr Fahy challenged the forces of the new independent Ireland. The Catholic Hierarchy, Cumann na nGaedheal and later Fianna Fáil all felt the ferocity of his habitually intemperate statements, speeches and activities. Fr Fahy campaigned with his friend and mentor Peadar O’Donnell for the abolition of the land annuities. In 1929 this led to his arrest, trial and imprisonment in Galway Jail. 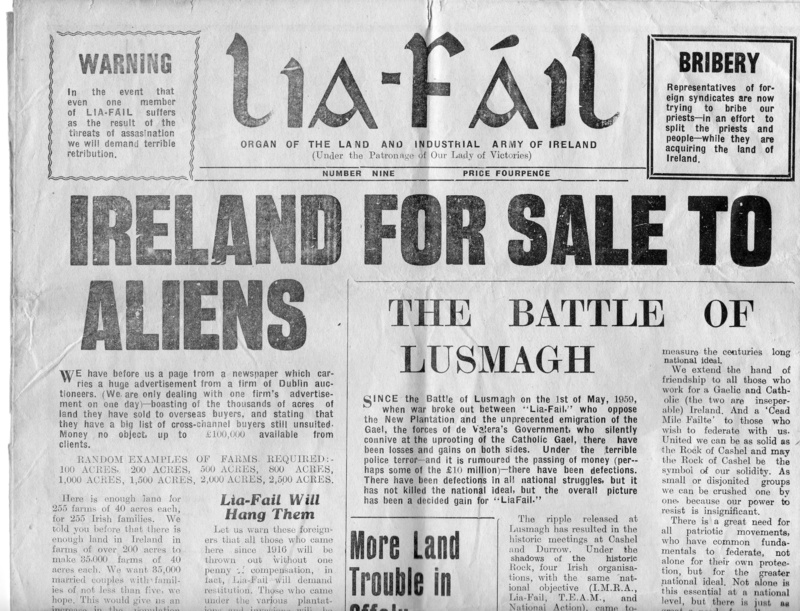 In 1957 while serving in Lusmagh—the only parish of Clonfert diocese in Co Offaly – Fr Fahy set up Lia Fáil (Ireland For The Irish) and he claimed to have over 10,000 members eventually in this Land Army. He almost single-handedly wrote the ten issues of a highly inflammatory newspaper also called Lia Fáil between 1958 and 1960. During his life, Fr Fahy also wrote political pamphlets, a propagandist play, short sketches with strong political messages, political manifestos, a Utopian novel and religious publications, the best known of which was ‘The Sacrifice of the Mass, The Greatest Thing on Earth’ published in 1957 by Browne and Nolan. Controversial Lia Fáil land agitation activities in 1959 resulted in court appearances and jail sentences for some of its members and a transfer and demotion for Fr Fahy to a curacy in Abbey. He died in Galway Regional Hospital on 19 July 1969. His funeral was the largest ever seen in the parish. Ruaidhrí Ó Brádaigh Sinn Féin T D for Longford/Westmeath, Chief of Staff of the IRA and later president of Republican Sinn Féin unveiled a headstone over Fr Fahy’s grave in Abbey Churchyard in July 1970. Fr Fahy is a granduncle of the famous Cooney and Fahy Galway hurling families. Jim Madden from Banagher, Co. Offaly wrote a biography of Fr Fahy entitled ‘Fr John Fahy Radical Republican and Agrarian Activist 1893-1969.’ The book, published by Columba Press, Dublin in 2012 carries a foreword by Gearóid Ó Tuathaigh, Professor Emeritus in History, National University of Ireland Galway.